Isn't it just frustrating when we need to spend so much time in untangling our earphones or chords before we can use them? Now, we have a solution to fix that - Darller Leather Cable Cord Management! - Our cable holder are made of prime quality leather material for durable use, and cord management rustic leather appearance improves with age and usage. - This cable management keeps your cords, cables, earbuds and chargers securely organized and looking good. The metallic snap is easy to pop open and close, but will hold together even on the bumpiest of journeys. - The cord keeper is perfect for work, travel, school and home. The portable, sleek organizer fits into any occasion. Go about your busy day without having to deal with a tangled mess of cords every time you go to use your electronics. - If you're tired of constantly trying to untangle your headphones, charging wires,This leather cord keeper worth you to try. 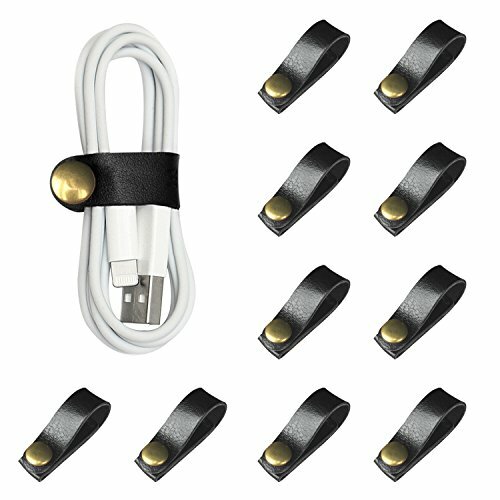 GREAT MATERIAL - Our leather cable ties are made of prime quality leather material and metal snap fastener button for durable use, and cord management rustic leather appearance improves with age and usage. STRONG FUNCTION - This leather cable strap keeps your cords, cables, earbuds and chargers securely organized and looking good. Ideal for keeping all kinds of cords cables well organized and tidy in place. PERFECT CHOICE - Our leather wire tie is perfect for work, travel, school and home. The portable, sleek organizer fits into any occasion. Go about your busy day without having to deal with a tangled mess of cords every time you go to use your electronics. EASY TO USE - The metallic snap is easy to pop open and close, but will hold together even on the bumpiest of journeys. The small, portable size makes these cable straps perfect for keeping together your electronic accessories and supplies while you travel! If you have any questions about this product by Darller, contact us by completing and submitting the form below. If you are looking for a specif part number, please include it with your message.